Acquire your evidence with EnCase, whether it’s a hard drive, memory, mobile device, or even logical evidence such as files or folders. Integrating these tools into your current processes will help uncover the truth quickly while allowing the examiner to work within whatever tool they are most comfortable with to achieve the best results. These options allow the investigator to choose whether they want to perform a quick, full, or sector level search. You can then select whether you want to export your results only to IEF, to an excel spreadsheet, or to bring the data back into EnCase as an LEF record. The next options include artifact selection. While the connector doesn’t list every specific artifact available within the IEF application, it does allow the user to select the artifact groups (Multimedia, Chat, Email, Browser History, P2P, Mobile Backups, Cloud, Social Networking, and Game Console). Once all the options are set, IEF is launched against the evidence and the searching will begin. From there, the investigator can choose to work within whatever tool he or she is comfortable with as both EnCase and the IEF Report Viewer have their own strengths to assist with evidence analysis and reporting. We also offer a processor module that works just like the EnScript connector but if your investigation includes any pre-analysis processing activities in EnCase, the processor module allows examiners to include an IEF search as one of these activities. 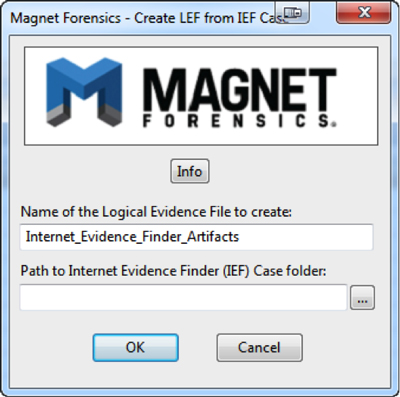 Once the module is added to EnCase, the investigator will see the module listed as “Internet Artifact Search with IEF by Magnet Forensics” as one of the processing options. This works extremely well when the examiner has planned to run several processes and searches overnight and begin analysis in the morning maximizing their productivity and not waiting for any labor intensive processes or tasks to finish. The third tool available to help investigators to better integrate IEF and EnCase is the LEF Creator EnScript. 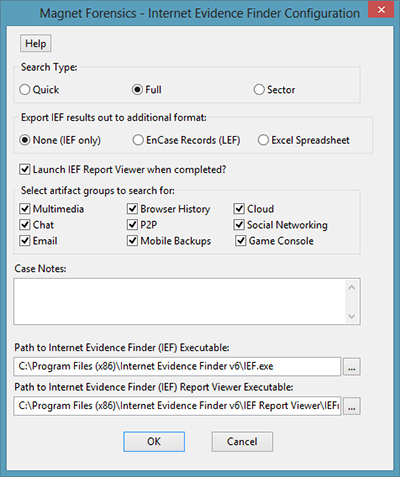 This tool allows investigators to import all the evidence collected with a previous IEF search into EnCase to assist with further analysis. This will help examiners perform additional tasks on an already completed IEF search or quickly verify their findings with a secondary tool. Just point the EnScript to the location of the IEF case folder and press ok. The script will pull all the evidence collected with IEF into EnCase as an LEF which can then be searched or analyzed within EnCase. 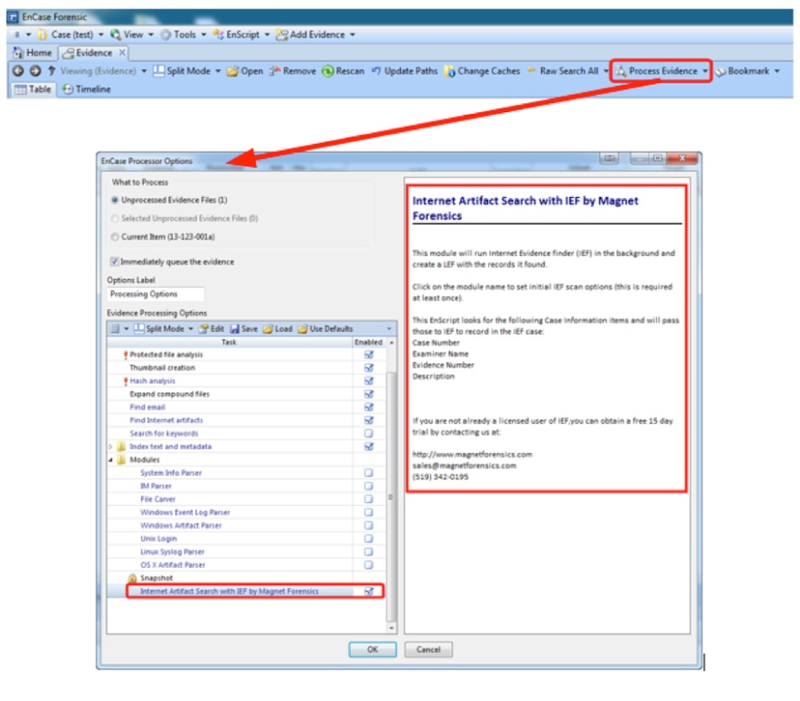 The artifacts recovered from IEF will be reported as records within EnCase where the investigator can proceed to bookmark or search the IEF records together with any evidence already loaded into EnCase. Another benefit of consolidating evidence from multiple tools allows the investigator to organize the data into one uniform report for all of the stakeholders for the case. At the end of the day, your investigation is about getting the most thorough results possible, using the best tool, or tools, for the job. We want to make sure you have access to everything that is required to complete your investigation efficiently and effectively. It’s essential that the tools and resources you use make your job easier while also maximizing the evidence recovered and analyzed in a timely manner. Integrating IEF and EnCase seemed only natural for many of our investigations and we hope that these scripts and processes do so for you as well. As always, please let me know if you have any questions, suggestions or requests. I can be reached by email at jamie.mcquaid@magnetforensics.com.